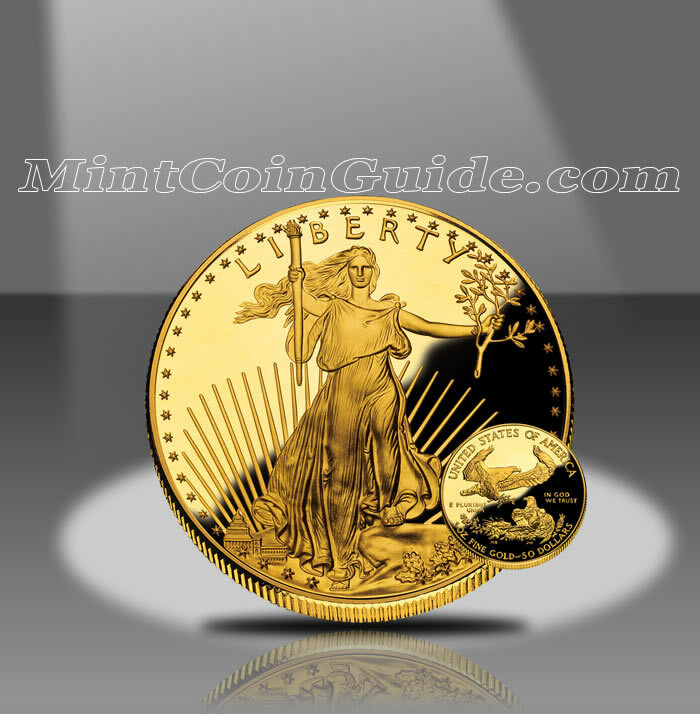 The 2007 American Gold Eagle Coins saw increases for the Proof Gold Eagles, but declines in both the bullion and uncirculated versions of the coin. Factoring into the bullion decline, the gold market continued to rise as it had done annually since bottoming out in 2001. The precious metal averaged $695.39 an ounce for the year, up a very respectable $91.93 from the previous year’s average. Also probably affecting the bullion mintage was the fact that 2007 marked the second year in which the US Mint created a numismatic version of the coin – the Uncirculated Gold Eagle. Total Bullion Gold Eagle mintage reached a record low level for the year, being drug down by One ounce and 1/4 Ounce Eagles which had also never reached a lower level before. Proof Eagle mintage showed improvement across the board. This was somewhat surprising as no special sets were offered by the Mint during the year aside from the normal 4-Coin Set. The chart below shows the total mintage of 2007-dated Proof Gold Eagles which includes the number sold as part of the Proof Gold Eagle 4-Coin Set (of which 34,236 were sold). Uncirculated Gold Eagle mintage declined for the year owing to the fact that they were not included in any special sets during the year as they had been in their debut year of 2006. The chart below shows the total mintage of 2007-dated Uncirculated Gold Eagles which includes the number sold as part of the Uncirculated Gold Eagle 4-Coin Set (of which 7,004 were sold). The 2007 Gold Eagles were the twenty-second year in which the US Mint produced the strikes. Bullion Eagles were available from the Mint’s network of authorized purchasers for most of the year. The Mint started offering the Gold Proof Eagles on February 5, 2007 while the Uncirculated Gold Eagles were offered on April 27, 2007. The Mint sold the Bullion Eagles through its network of authorized purchasers for a small premium above the current spot price of the gold contained within them. The Mint also adjusted the prices of its Proof and Uncirculated Eagles during the year to adjust for the rising cost of gold. A ‘W’ mintmark on the proof and uncirculated Gold Eagles indicate they were struck at the US Mint’s facility in West Point. A version of Lady Liberty that was first featured on the 1907-1933 Double Eagle Coins found on the obverse (heads side) of the Gold Eagles. It was originally designed by Augustus Saint-Gaudens. The reverse (tails side) shows the nest of a family of eagles with the male soaring above it. It was designed by Miley Busiek.